I’ve been behind the wheel and I’ve been mounted up on a bicycle cascading through the busy city streets, so I have a pretty good idea of what a cyclist goes through as he/she dodges aggressive drivers, pot holes, and roadside debris, and what a frustrated driver goes through as he/she is forced to go five MPH behind a sauntering cyclist smack dab in the middle of the street. There are rules of the road for cyclists and drivers alike and if those rules were followed by both, bicycling wouldn’t be so dangerous, because let’s face it, a car can kill someone on a bicycle and not the other way around. The New York City Department of Health estimates that over a half million New Yorker’s ride bikes and the bike culture continues to boom in NYC. Many city streets do not have specific shoulders for bike lanes so this causes cyclists to bike alongside and cut in between automobiles – some of these cyclists do this without even wearing helmets and some of these cyclists ride in the night time without headlights or reflectors, making it hard for a driver to even see them. Biking is certainly a major way to commute in NYC, but if there are no bike lanes it’s not really the bikers fault if they are cycling in the middle of a busy street – but it’s not so smart either. As a licensed driver, I’ve been stuck behind a casual biker many times and there is really nothing you can do about it. The driver is forced to go five MPH behind a biker and cause traffic for everyone else. These cyclists never show any signs of remorse that they are holding up a line of 10-15 cars. They’ll never turn around to see what’s going on behind them and they’ll never go up on the sidewalk to let the cars pass, but they can surely hear the horns of several different cars beeping simultaneously. Bikers and motorists have practically the same responsibilities when it comes to the rules of the road, but the ones I personally find that do not obey these rules are the cyclists. Many times the cyclists don’t even follow their own rules. When there is a bike lane, the common rule is that the bikers bike the same way of the traffic. Sometimes there are bikers coming from all different directions in a narrow bike lane, which makes it dangerous for all bikers involved and dangerous for the motorists. Many times bikers think that the streetlights don’t apply to them, but it’s important for a bike to yield when a red light is coming up – if not, this is how accidents happen. Everyone on the road – whether you are biking, driving a car, skateboarding, running – should know the rules of the road and follow those rules. 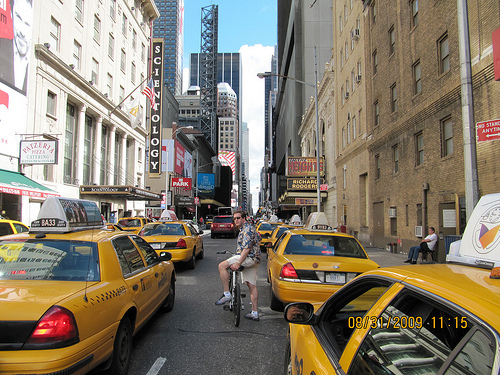 Riding a bike on the streets of NYC is not a leisure activity; it’s practically an obstacle course full of death traps. Know your roads and how to ride them. This entry was posted on Monday, February 21st, 2011 at 2:54 pm	and tagged with Biking, Danger, Motorists and posted in Multi-media. You can follow any responses to this entry through the RSS 2.0 feed.